Twelve suspects involved in vandalism attacks at a hospital in northwest China's Shaanxi Province have been arrested yesterday, according to local police. 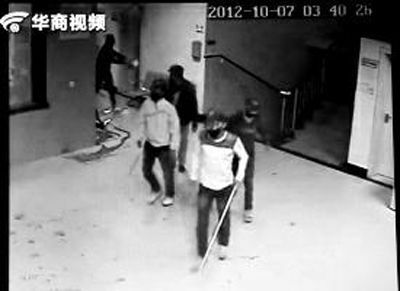 A group of masked men had been smashing the Century Hospital in Xianyang, Shaanxi Province in northwest China three times from September 13 to October 7. Many medical facilities were destroyed. "We have lost almost 100 thousand yuan (around US$13,000) just in terms of property," said Wang Dongjun, vice president of the hospital. "Three staff on duty were also injured." Wang said the hospital was smashed because it didn't agree with the demolition conditions provided by the property developers. "We invested over 20 million yuan into construction of this hospital, but the developer only plans to compensate 1.4 million yuan for demolition." Zhao Zhengyong, head of Shaanxi province pledged to examine the issue in October. Apart from the 12 arrested, the local police are after those at large at this moment.